A good way to determine the best wedding gown preservation technique would be to check with museum textile conservators to see how they preserve heirloom garments and what their recommendations are for wedding dress preservation. But who has the time? That is why we have done the research for you. We have consulted with museum conservators at the Smithsonian Institute in Washington, D.C. and the Victoria and Albert Museum in London and summarized the information they gave to us. 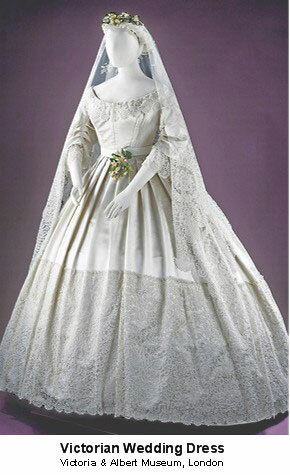 The Victoria and Albert Museum in London has a wonderful collection of gowns that are hundreds of years old. The dresses in storage are hung on padded hangers and covered with cotton sheeting to protect them. Garment preservation at the Smithsonian Institute in Washington D.C. is similar. Heirloom garments that are not currently on display are cleaned and carefully stored in climate controlled conditions, in the dark. Most dresses are hung on padded hangers, while some garments are laid in drawers or acid free boxes with acid free tissue. Sharp creases are avoided, as they can damage fabric. To keep the folds from becoming permanent creases, the garments stored in boxes or drawers are refolded into a different position every few years. 1. Fabric weakens where it is sharply folded and creased. Fabric weakens in the same way that paper weakens where it is folded, so that creases from the folds may become permanent. (You may have experienced this if you have ever let down the hem on a garment.) Or worse, the fabric may tear at the weakened creases. This is why the Smithsonian refolds the garments stored in drawers and boxes periodically. 2. Risk of mold and mildew growth. If a garment is stored in an environment with more than 60% relative humidity, it can encourage the growth of mold and mildew spores on the garment, especially if the garment has not been cleaned. 3. Periodic Inspection is critical. Inspection ensures that the garment does not develop permanent damage from oxidizing stains or any other problems. The sooner problems are discovered, the more likely they can be remedied. Museum conservators recommend keeping wedding gowns and all heirloom garments: clean, cool, dry, wrinkle-free and in the dark. So cleaning your wedding gown is the first step in proper wedding gown preservation.